Welcome to the Hudson Valley Windsurfers! 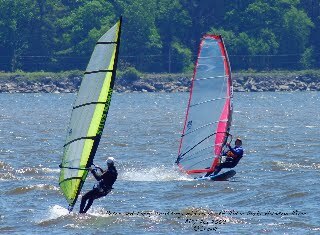 We are a non-profit, non-commercial organization dedicated to windsurfing in the mid Hudson Valley. Our primary sailing area extends from roughly New York City and Cornwall-on-Hudson in the south to North Germantown in the north. On any weekend when the wind blows, someone will probably be sailing at either Kingston Point Park or Rider Park. Man made: Boats, navigation traffic, both large and small. Know who has the right of way but always avoid even if "you're right". Check your launch point and know these factors. If the tide is going out and the current is high, this can cause a very dangerous fast flowing water. And ALWAYS let someone know when you plan to be on the water and when you plan to return. We maintain a members-only email list (reflector) on Hudson Valley Windsurfers (mostly north of Cornwall) and Hudson River Windsurfers (Mostly south of Cornwall).